My inner fangirl is out for a limited time. You realize you can fall forever and never run out of stars. 4.5 stars. Magical. Magical. Magical. Laini Taylor is absolutely magical. Her words are beautiful, her characters are quirky, and I am in love with the atmospheric charm. 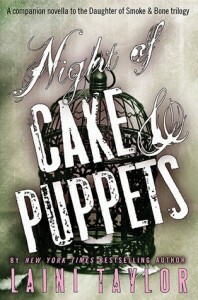 I want my own Night of Cake & Puppets.